When I said I was going “beyond the book review,” I must have really meant beyond, way beyond. 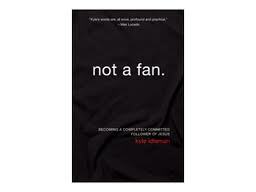 Here we are many weeks later and I am still discussing Not A Fan by Kyle Idleman. Yes, it is just that good. In Chapter 6 we get to discuss the third part of the Holy Trinity: Holy Spirit. God and Jesus are easy to discuss, but often times discussions regarding the Holy Spirit get uncomfortable. I just have to share how Kyle explains this discomfort as I found myself literally “laughing out loud” as I read it. The people in my office thought I was losing my mind. “When you read ‘Spirit-filled ” you got a little bit uncomfortable. Fans tend to be comfortable talking about God and Jesus, the third member is like the Cousin Eddie of the Trinity; you just don’t know what to do with him. It reminds me of how I’m treated by my in-laws. I married a girl from a small Kansas town……Her family tries to make me feel welcome, but whenever I show up I can almost hear that old Sesame Street theme song in the background, One of these things is not like the other. One of these things just doesn’t belong. How’s that for some real honesty? Ephesians 1:13: And now you Gentiles have also heard the truth, the Good News that God saves you. And when you believed in Christ, he identified you as his own[d] by giving you the Holy Spirit, whom he promised long ago. It is clear to me from scripture that we receive the Holy Spirit when we accept Jesus Christ as our savior. So, if that is the case, why is there such debate about being “filled with the Spirit” and “baptisied by the Holy Spirit”? Well, even though we are given the Holy Spirit upon salvation, many of us do not accept and understand the powers and gifts of Holy Spirit and therefore don’t walk in the Spirit or operate under its full capacity. This is why fans who try to follow with Jesus without calling on the Holy Spirit will reach a point where they become frustrated by their failures, and many fall away. Why? Because they are trying to do it on their own, in their own strength. Once I started operating in the Spirit, my walk with the Lord grew to a much greater depth. My circumstances didn’t change, but my whole outlook on life changed. I finally found that “peace that surpasses all understanding” I had been looking for all my adult life. Holy Spirit is real. Holy Spirit is just as important in our lives as The Father and The Son. I’ll admit it, I used to be jealous of the people in the Bible. I used to think they had an advantage over us because they could actually see and talk with God and Jesus. Then one day I read something that made me realize that we are the ones who have the advantage because we have God living inside of us. Did you catch that? Jesus, God in the flesh, says the Holy Spirit is better! Once again meaning, it is good to have God with you, but it is better to have God in you. The Holy Spirit is God in us! If only we would all open our eyes to the scriptures and stop worrying about denomination loyalty. I believe this is one of the greatest areas our churches are failing: we are not teaching on the Holy Spirit and the power of the Holy Spirit. When did the disciples step up their game and start truly falling Christ? It wasn’t until after Christ’s death, resurrection, and ascension into Heaven that they began to start leading and teaching. Why? Because when Jesus went back into Heaven, He sent the Holy Spirit, and once the disciples were filled they could operate on the strength of the Holy Spirit and not of themselves. The Holy Spirit is real. Just as real and important as The Father and Jesus. Don’t let fear stop you from going to that next level. Study the scriptures. Do your own research. Get with fellow believers who are spirit-filled so they can give you their perspectives. Dear Lord, if this is of you I want it; but don’t let me fall to false teachings. Protect me from the enemy Lord. It is my desire to have everything you have for me, to be the person you made me to be. If this is real, fill me Lord, fill me Lord. Mr. Idleman goes into further detail on this subject and if you found this helpful or interesting, I encourage you to get a copy of the book and read it for yourself. You won’t be disappointed. This is such a great read! I’m going to have to catch up on the other posts you’ve done about this book. Interest officially piqued. Thanks! I’m glad it peaked your interest as it is an excellent book. I encourage all to read the complete book as I can’t possibly share everything that is worthy of sharing. God bless! Next Next post: Saved From Hell or Saved From Sin?